Aztec Eyeopener A light roasted coffee to get you started in the morning. A blend of all Central American coffees. Big Island Buzz A medium roasted coffee that let's the coffee taste come through. A blend of Hawaiian and Central American coffees. Caffe Bella A beautiful Italian (really dark and rich) roast that goes great with cream added. Blends of Central American coffees. Our own creation of Central American, South American and Indian coffees. Roasted dark for that bold espresso flavor necessary when making lattes, mochas, cappuccinos and all espresso drinks. Can also be brewed for a wonderful tasting dark roasted coffee. Decaf Espresso (Caffe Primo) Need decaf in your life? This one is sure to please your pallet. A blend of Indonesian and South American coffees. Fiesta Blend Looking for a nice dark roast? Fiesta Blend is perfect. It's a blend of Central American coffees that works well by itself or with cream or sugar too! Flyin' Hawaiian is a great new 100% Hawaiian Blend made with 100% `Oahu coffee and 100% Ka`u coffee both roasted to a perfect medium. Experience this wonderful blend of coffee from the far east and the far west of our beautiful state. We know you'll love this exceptional coffee. 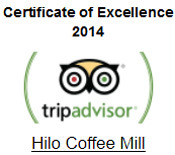 Hawaiian Blend (Regular & Decaf) Our most popular coffee at the restaurants and homes here in Hawaii. It's a medium roasted blend of Hawaiian and Central American coffees. Holo Holo Blend Holo Holo is our newest 100% Hawaiian coffee blend. 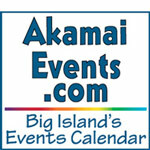 In Hawaiian, holo holo means 'to travel around'. 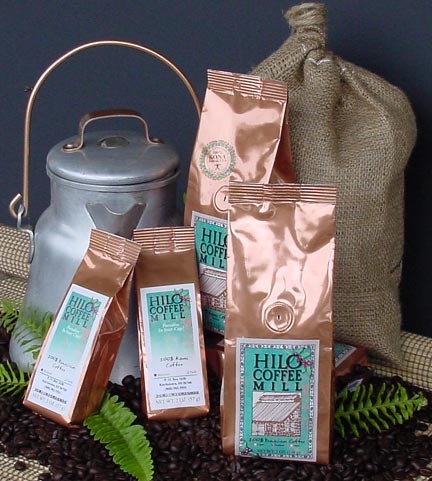 This wonderful blend is made from coffees from each of the districts on the Big Island; Hamakua, Ka`u, Kona, and Puna. And each one has it's own special roast. So you'll receive medium, full city and dark roasts all in the same bag. Sure to be a coffee you'll order over and over again. Hilo Rush One of our best selling coffees. A blend of Indonesian, Central and South American coffees that'll give your morning a good start. Plenty of caffeine. Kona Blend (Regular & Decaf) Our Kona Blend is a blend of Kona coffee and Central American coffee. It's Italian roasted for a bold, rich flavor. Puna Punch This one really does pack a punch. Light roasted for maximum caffeine. A blend of Hawaiian coffee from Puna (that's where we are) and our favorite Central American coffee. You won't be dissappointed.